The OnePlus One comes with a Japan Display-made 5.5" screen of 1080 x 1920 resolution for a pixel density of 401ppi which is pleasingly sharp, even at this diagonal. QHD would've made a difference in web pages or optimized apps, but 1080p is fine. The display is an LTPS unit, a low temperature polysilicone LCD, meaning it shouldn't heat up too much even with the brightness cranked up for long periods of time. The LCD is also an IPS unit, which should favor wider viewing angles. Finally, the screen is covered by Gorilla Glass 3 for extra protection. 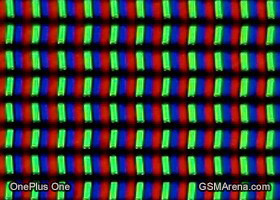 The OnePlus One's LCD has a standard RGB (red, green, blue) matrix with equally-sized sub-pixels of each color. Looking at the numbers the OnePlus One's display is good but certainly far from the best. On the positive side, it's good really wide side viewing angles and it's also very bright at it maximum. But the contrast ratio is not really good as the black levels are pretty high. When you crank the brightness all the way up, the OnePlus One outputs almost 600 nits, which is respectably bright. Unfortunately, the blacks aren't very deep neither at 50% brightness, nor at 100% and that affects the effective contrast ratio negatively. In layman's terms the display has only an okay contrast due to the poor blacks, which aren't very pronounced. Brightness is quite good though. The next test reveals how the contrast of the screen does in outside conditions. This test is mainly dependent on the maximum brightness output and the reflectivity of the glass on top of the display. Here the OnePlus One gets a good result but again far from the best in this class. With a 3,100Ah battery, the OnePlus One sounds well covered in the battery life department, but the real-world results fail to truly excel. While it managed almost 20 hours of call time, close to 10 hours of browsing and 11 hours of video playback, the One was let down by its power management in stand-by as compared to other devices. Indeed, despite that shortcoming, the OnePlus One scored a respectable overall rating of 66 hours - the expected time between charges if you use the device for an hour each of calls, browsing and video playback a day. That's by no means a bad result, meaning you can reasonably expect a full day or more of heavy use - after all, there's a big and quite bright display to consider. Our proprietary score also includes a standby battery draw test, which is not featured in our battery test scorecard but is calculated in the total endurance rating. Our battery testing procedure is described in detail in case you want to learn more about it. 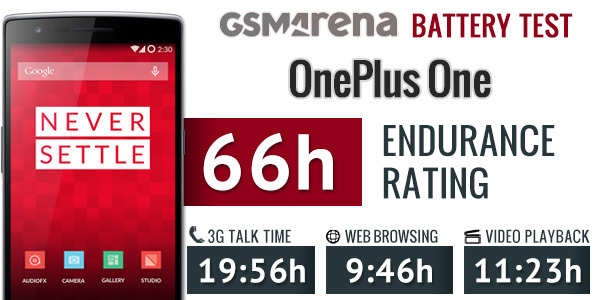 You can check out a detailed battery life test of the OnePlus One here. 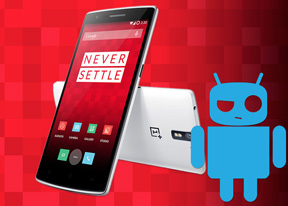 The OnePlus One offers a great connectivity package out of the box with the only noteworthy exception being an IR blaster. With quad-band GSM, penta-band HSPA and hexa-band LTE on its resume, the One is a true globetrotter. There's a full set of a/b/g/n/ac Wi-Fi standards on both 2.4GHz and 5GHz bands, Wi-Fi Direct, hotspot and DLNA sharing of media with supported devices like TVs and PCs. NFC is supported and there's stereo Bluetooth 4.1, as well as microUSB 2.0 with On-the-go support.